Kolkata: Delhi Hoopers pull off an emphatic win over Ahmedabad Wingers to be crowned the 3BL Round 3 Champions of 3x3 Pro Basketball League. 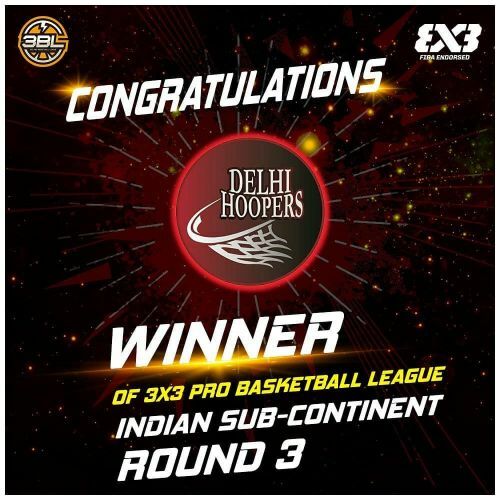 Delhi Hoopsters, who won the first and second round of the first-ever India's 3x3 Pro Basketball League, emerged as champions of basketball league again. Delhi Hoopsters defeated Ahmedabad Wingers by 21-17 and emerged as champions again for a third time straight in a row of the first ever India's Basketball League. Kolkata hosted the third round of the first and only league in India recognized by FIBA on the two days 7th and 8th July. Delhi Hoopsters consists of Inderbir Gill, Kiran Shastri, Harkirat and Dhruv defeated Round 1 runners-up Ahmedabad Wingers consisting of Sushant, Rajan, Ritik and Lima by 21-17 and topped the team standings of round 3 of the basketball league. Kiran Shastri of Delhi Hoopsters become the Most Valuable Player (MVP) of the round 3 of the pro basketball league. Inderbir Gill a teammate of Kiran Shastri of Delhi Hoopsters becomes continuosly Most Valuable Player (MVP) of the first and second round of the league. Delhi Hoopsters tops the team standings of the league by winning the third round and Ahmedabad Wingers are at the second position after the third round. 3x3 basketball is a shortened variant of the widely followed 5x5 format, with just half the basketball court and a hasty 10 minutes of gameplay. A team of 4 will have 3 players constantly on the court with 1 rolling substitute. This is its inaugural season in India, with an introduction of 12 teams – Delhi Hoopers, Chandigarh Beasts, Jaipur Regals, Aizawl Legends, Kolkata Warriors, Ahmedabad Wingers, Bangalore Machas, Goa Snipers, Kochi Knights, Hyderabad Ballers, Chennai Icons and Mumbai Hustlers. The league will further continue in Chennai, Bangalore and Mumbai up to the 26th of August 2018. Chennai will hosts round 4 of the Pro Basketball League.